When the railroad came into being, they had a different name for each of the train stops. Even though the town was known by another name, the railroad called the stop "Magnolia" because of the beautiful Magnolia trees. 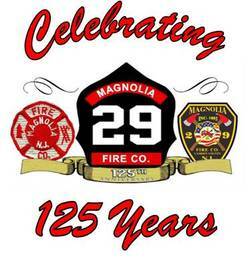 Led by the total destruction of a home and a need to reorganize the Citizens Fire Department, the Magnolia Fire Company was founded and incorporated. The members that were with the company in it's first few months were; Frank Bender, A.H. Kraft, Theo H. Maiser, Albert H. Charman, L. Graw, George Lambert, Alines J. Rush, Earle Ellis, Frank Till, Buy Fernandez, Christian frebe and Michael MacGarvie. The first meeting was held on December 9, 1893. George Lambert was elected as the first President. There was no Chief until 1899,which was a sign that the men worked together, without real rank, for a common goal; to protect the town from the possible ravages of fire. The Company began with two pieces of apparatus, a two wheel, hand drawn chemical cart and a hook and ladder truck. In 1908, the company had only the chemical cart after selling the hook and ladder to the newly formed Stratford Fire Co. for $40. It was not until 1917 that the company bought a new apparatus- a Buick car with a truck body from NJ Auto Supply for $600.00. Despite what seemed to be a shortage of equipment, the men did fine. Over the next 25 years, there were only 39 fires...a miniscule amount considering that in 1992 alone, the company responded to 141 alarms. In December of 1893, the Atlantic Railroad Company donated a steel locomotive wheel to be used as a fire alarm. The number of times that the bell was struck signified to the men what part of the town the fire was in. In 1908, this wheel was replaced with a new 32 inch bell at a cost of $52.25. The new bell was hung in a bell tower that was constructed on the roof of the fire station at 208 Jackson Ave. The station was built on land that was donated by George Brooks. The total cost of the new station was $852.50. Before the station was built, the men kept the apparatus in a barn and held meetings in the Alpha Ban Hall. The fire company remained on Jackson Ave until 1929, when a new station was built on the present site on Evesham Ave. The Jackson Ave. station was torn down in 1932. In 1922, the fire company purchased two lots that the future two story fire station would be built upon. Construction began in April 1929, and by the end of the year the Magnolia Fire Company had a new and lasting home. In 1919, the fire company bought a new truck from the Vim Motor Company for $4,355 (minus $500.00 for the problematic Buick truck). This piece had a 35 gallon tank and served the town for many years. In 1925, the company bought a Reo pumper. This truck faithfully served the town until 1948. It was in that year that the company purchasd their first Mack apparatus. The company stayed with Mack pumpers until 1992 with the purchase of the modern E-One pumper. The Borough Council began holding their meetings in the fire hall in 1933. The Council continued to meet in that building until it was destroyed by fire in 1964. The fire of 1964 also claimed several books of minutes from 1939 -1949. The fire company rebuilt after the 1964 fire. The second floor of the building was torn down and an extention was added to the already enlarged engine room,as well as an addition onto the back of the hall. The fire company was a center of social activities from when it's hall was on Jackson Ave. In the Jackson Ave. hall they showed movies and news reels. They continued to show movies at the Evesham Road hall for several years. The fire company has always played an active roll in the town's Fourth Of July Parade, and in 1940 began the tradition of bringing Santa to town on Christmas Eve.